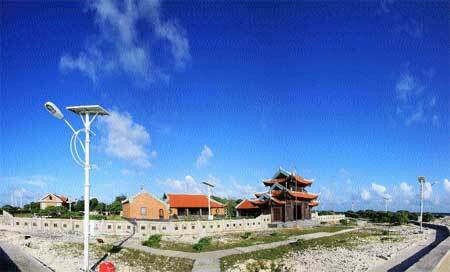 The imposing pagodas on the Truong Sa (Spratly) Islands not only contribute to asserting the sovereignty of Viet Nam, but also act as a "spiritual fulcrum" for the soldiers and residents of the islands. The Song Tu Tay Pagoda located on the Song Tu Tay (Southwest Cay) Island (the island towards the north of the archipelago) is currently the largest one in the area. It was built in a traditional style, with the main sanctum having three chambers, in addition to two sub-chambers and a garden. The pagoda's architecture, along with the lighthouse and the statue of Hero Tran Hung Dao, (who defeated the Yuan-Mongol invaders in the 13th century) on the island constitute a unique architectural complex. The pagoda's main sanctum faces Ha Noi. All the horizontal lacquered boards and parallel sentences in the pagoda are gilded and written in romanised Vietnamese script and their content expresses the Vietnamese' desire for peace. For every delegation of guests arriving on the island, the first destination is the pagoda. Generally, Buddhists and people from the mainland visit the pagodas to pray for a peaceful and prosperous life. But when people visit the pagodas in Truong Sa, including the Song Tu Tay Pagoda, it is a special experience. People pray not only for Viet Nam's prosperity, but also for the Vietnamese' sovereignty being sustained forever. The monks at these island pagodas are not afraid of bearing the hot sun and storms to stay on the islands, and pray for a peaceful world without war and hatred. "Prosperous country and people" - this saying connects the Buddhist religion and life to the people of Viet Nam. While residing on the islands, the monks have defined their responsibility by helping Buddhists observe the religion, and also praying every day for the war martyrs, who sacrificed their lives to defend the sovereignty of the islands. Under the shade of the pagoda's roof and the old trees nearby, monk Thich Nguyen Thanh, who has been residing there since October 2014, narrated stories about the human experience. The monk compared life with the waves of the East Sea. Sometimes the waves were big, sometimes small, just as human life, filled with its share of ups and downs. "Going to the pagoda helps you keep your mind very still between every wave and fluctuation of life," he said. Indeed, when people visit the Song Tu Tay Pagoda, it is easy to feel peace, ignore all greed and worries rooted in reality. People also treat each other with love and more compassion. 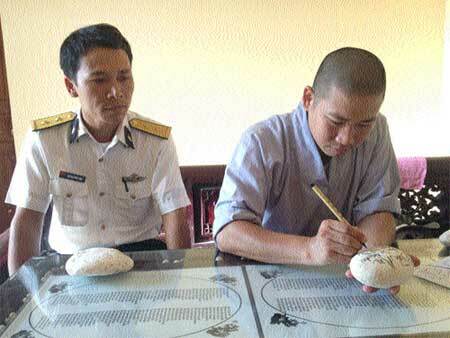 At our meeting, the monk gifted me with an "Enlightenment" script that he had written on a stone shaped like a flower horn fish. This was fortunate and this special gift became an unforgettable memory of Truong Sa. At the pagoda, I also met the family of Doan Duy Kiet and Pham Bich Luyen, from the island, who offered us incense at the pagoda and took us to meet the monk. On the Truong Sa (Spratly) Islands, ancient temples and shrines were built by Vietnamese fishermen during the past, to pray to the Heaven, Buddha and the Gods to bless them with peaceful voyages and a bountiful catch. On the same basis, the pagodas of Song Tu Tay, Sinh Ton, Truong Sa Lon, Son Ca and Nam Yet were also developed to become "cultural milestones" that would contribute to affirming the sacred sovereignty of our country. The couple have two small children, and the second one was born on the island. "We and other families always visit the pagoda on a full moon day and on the first day of every lunar month, to listen to the monk's sermon. Every day, the sound of the pagoda bells help the islanders feel warm and closer to the mainland," he said. The pagoda's garden also features a banyan tree that has been cut from the "Sacred Banyan Tree of Tan Trao - the homeland of the revolution" awarded by the Tuyen Quang Province to the pagoda. Every day, the monk and soldiers on the island care for the tree, so that during the next few years its shade will add more majesty to the pagoda.